Italian physician; born at Montagnana in 1818; died at Padua May 1, 1881. He received his degree in medicine at the university of the latter city in 1851. In 1854, becoming interested in the diseases of silkworms, he began the study of them and presented memoirs thereon to the Academy of Literature, Arts, and Sciences of Padua, of which he was a member, and to the Institute of Venice. He published also two works on the same subject: "Cenni sull' Attuale Malattia dei Bachi da Seta" (3d ed. Padua, 1877) and "Ulteriori Ricerchi e Considerazioni sull' Attuale Malattia dei Bachi da Seta" (ib.1876). He wrote, besides, "Narrazione della Strage Compiuta nel 1547 Contro gli Ebrei d'Asolo e Cenni Biografici della Famiglia Koen-Cantarini" (Casale-Monferrato, 1875). 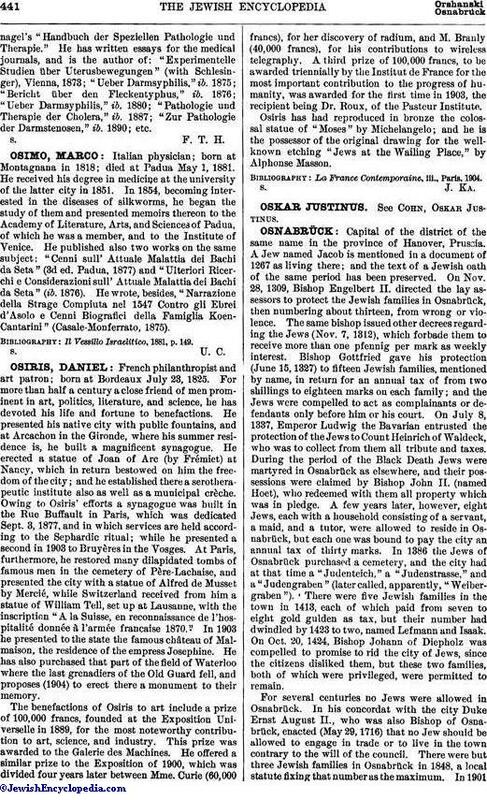 Il Vessillo Israelitico, 1881, p. 149.